Earlier this year Twitter launched a campaign #PoweredByTweets which asks people to ‘think of a way the power of Twitter could be harnessed to create a beautiful design or solve a problem’ the best ideas will then be showcased at an exhibition during London Design Festival. This got me thinking about all the great campaigns that are powered by not just Twitter but various other social media platforms too. So this is kind of a roundup of some of the best campaigns that use social media to power them and a few tips on how to put this into practice yourself. 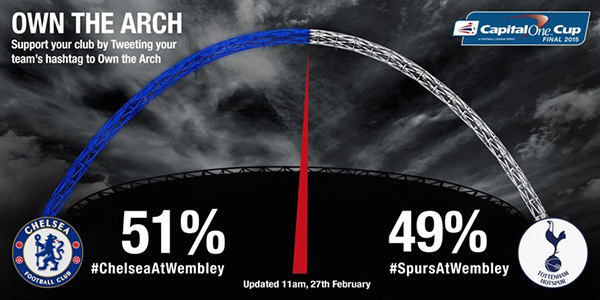 Capital One made the most of their sponsorship with their Own The Arch campaign whereby they encouraged fans to tweet with either #ChelseaAtWembley or #SpursAtWembley to ‘own the arch’ by changing it to their team’s colours on the day of the final. 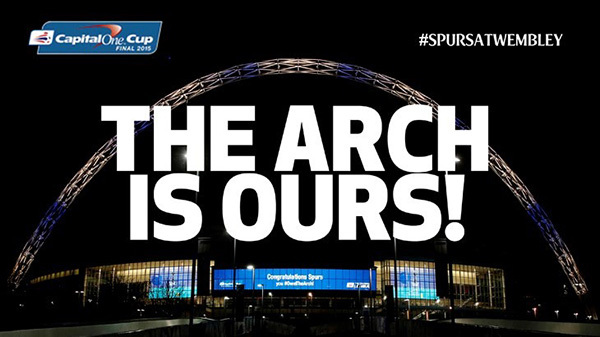 This got over 500K tweets Tottenham Hotspur winning the arch (but sadly not the match). 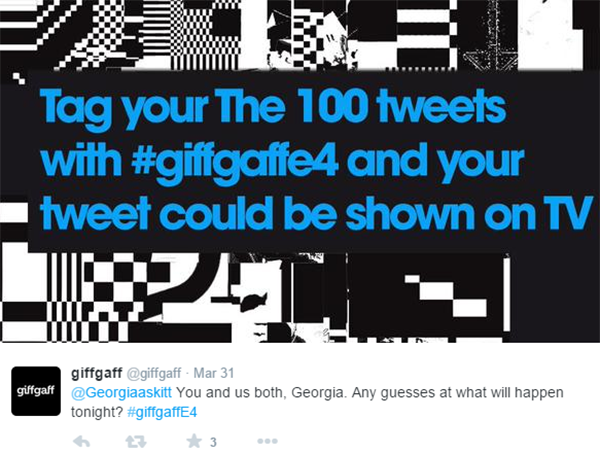 Mobile network giffgaff used social media to power their ident advertising slots on E4 by asking users to tweet using the hashtag #giffgaffe4 for the chance to have their tweet shown on TV which received a great reaction. 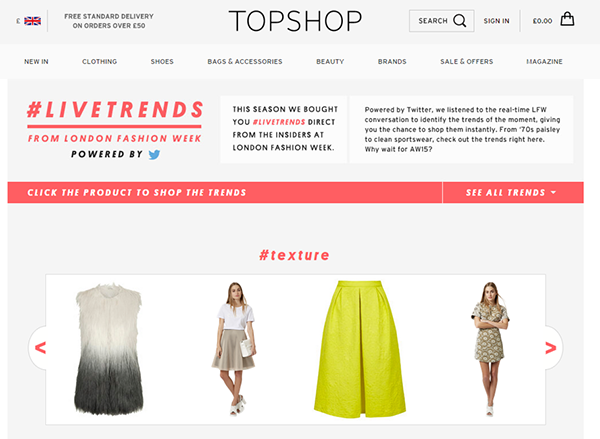 Topshop leveraged the buzz around their AW15 London Fashion Week shop to power online content, in-store experiences and and out of home advertising with its #LiveTrends campaign. 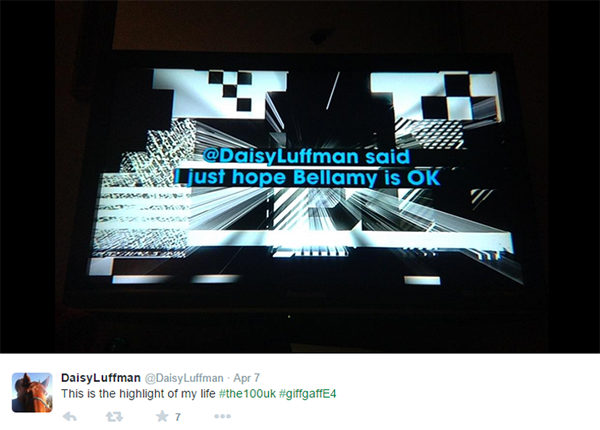 By listening to the reactions and conversations on Twitter during the show it surfaced the latest trends and made them shoppable for its customers. 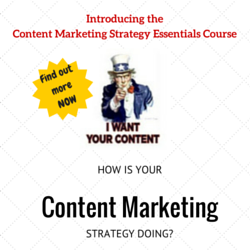 This generated overt 3.5M customer engagements and 75% sales uplift for the featured products. Hopefully those examples have given you some inspiration on how you can use social media to power some of your own campaigns. The key to all of these is clear communication between different team so making sure the social media team is involved with the ATL advertising team for example to come up with these kinds of campaigns. 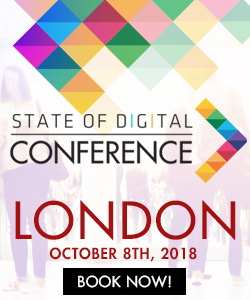 Have clear, defined outcomes – you need to understand what you want to get out of the campaign whether that’s user generated content, brand awareness, increased sales – this will determine what kind of campaign is right for you. Have a point – you need to understand what will motivate people to take part and what the point is for them; this could be to win prizes, it could be ‘fame’ or it could be just to do something good but people won’t do anything for nothing. Why We Need to Move From Building Links to Building Online Visibility?